How can you convey something so ineffable? 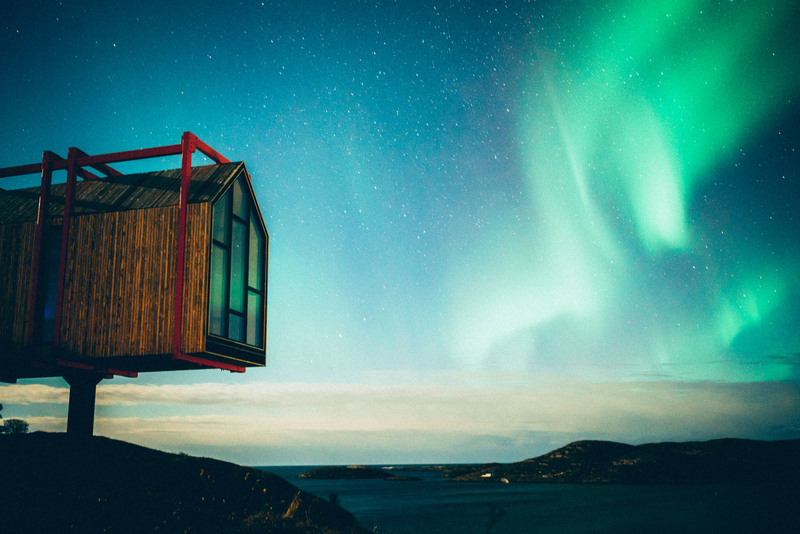 A tiny A-framed sleeping box on a glaciated island, fixed atop a 4 metre-high steel column that looks more birdhouse than living space. To the indigenous Sami people it echoes their traditional Njalla - a hut for storing meat, raised on timbers greased with animal fat to keep predators at bay. Indeed, that was its inspiration. Here though, re-imagined and impressively engineered it is a sanctum, oriented to bring the surrounding islands, and a sometimes hostile North Atlantic, into keen focus. Come here and you risk losing yourself in a stillness geared not so much to trendy mindfulness as to, well, a sort of mindlessness. "You first have to empty something", its owner Håvard Lund told me, "before you can fill it anew". The low-lying islands of the Fleinvaer archipelago are in the Nordland region of northern Norway, and humans have been living here for 5,000 years. Today its 360 islands have a permanent population of thirty-something, a paucity that reflects both its isolation and the country's ongoing struggle to halt a decline in its rural populations. To look out over these elongated, grassy, mesmerising islands you'd think the first signs of that decline began right here. Who knows, perhaps Fleinvaer was its inspiration, its epicentre? But that is a silly thought. It's too remote here, teetering too much on Europe's frigid edge, to be the epicentre of anything. Except, perhaps, as part of a brave new world of bespoke Norwegian architecture. Håvard is one of Norway's finest jazz musicians, and this place, Fordypningsrommet, or 'room for deeper studies', is his inspired creation, a collection of mono-functional 'sleeping boxes' as well as a kitchen/dining room, conference room and sauna, all clad in 5,000 individually hand-cut Kebony wood shingles that provide a natural bulwark in a challenging climate. Its construction was inspired too, raised by an army of volunteer 'carp-itects', architecture students turned carpenters from the University of Trondheim who gave up their time and picked up their hammers and set squares in the best traditions of that lovely Norwegian concept of Dugnad: Community. It looks idyllic. And really, it is. But even Dugnad doesn't always carry the day. 'Berry feuds' are a peculiarly Scandinavian thing, and one Fleinvaer family gets the ferry to Bodø on the mainland to buy berries because the owner of the only shop here that sells them went and picked their berries. Now they don't speak. It makes you think. I once picked cloudberries in a bog in northern Finland. I could have been shot . . . .
North of Fleinvaer more structures have been raised by another over-achieving Norwegian. In the 1990's the famed explorer Børge Ousland became the first person in history to trek to the North Pole alone and without a support crew, and the first to cross the Antarctic via the South Pole. In 2010 be began looking for a retreat of sorts, a silent place where he could conceive and plan future challenges. He could have lived anywhere, of course, but came and settled here, in the Steigen coastal region of northern Norway, where he purchased an island. This island. Manshausen Island in Grøtøya strait, a stone's throw from the mainland, is a great place to pretend you have Norwegian blood. You can learn survival skills, kayak, hop over to the mainland and rappel down mountains, even snorkel. You can explore the 140-metre deep Resshola sea cave, hike a glacier, traverse ridge lines, and ski in the nearby mountains of Nordland. 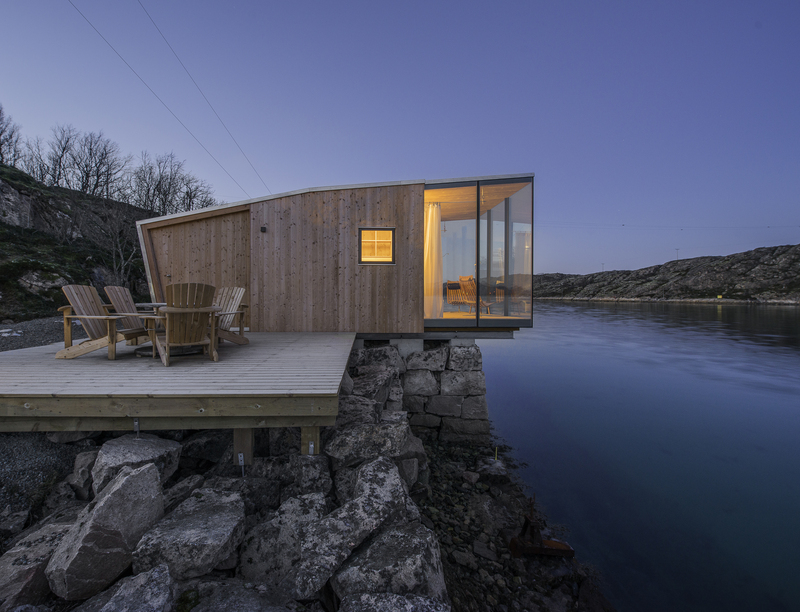 At the end of each day, assuming you're still conscious, a 'design adventure' awaits in the form of four bespoke glass and plywood sea cabins, three of which are dramatically cantilevered over the water on Manshausen's northern shoreline. Oriented north to take advantage of the Aurora Borealis, they have views across to another private island, this one owned by Randi Skaug, the first Norwegian woman to summit Mt Everest. Over coffee she told me how, on her descent from the summit, she waved to the second Norwegian woman to summit the mountain. Randi beat her by four hours. This impulse to climb, to confront nature for whatever the reason, was becoming a refrain. A woman who lives near Flåm in a valley surrounded by fjords where the sun is so low in the sky from October to February you can't even see it, told me she hikes to escape the fjord's "claustrophobic confines". She felt the need to "go up", she said, just to see a horizon. I looked up and nodded in sympathy. So it wasn't just me, then. Back on Manshausen the views were as wide as the earth is broad thanks to expansive forward-facing exteriors of double-glazed glass. Inside were two bedrooms, a kitchenette and small seating area, with screens you could lower to filter the sun and windows that opened to channel sea breezes. There's filtered coffee in its cupboards and even a 'mud room' to throw off all the bits of Norway you'll have so joyously accumulated. The trip was morphing into an architectural pilgrimage. Trondheim, Norway's third-largest city is full of design gems both old and new. I kayaked underneath the 1918 Skansen Bridge, a gorgeous iron truss railway bridge with a unique overhead counterweight, and passed by TYIN Tegnestue's fabulous "Lopsided House" (2013). Near to Trondheim, Stokkøya Island's 16 square kms are home to an emerging community of prefabricated, sustainable modernist housing which is helping put it, and Trondheim, at the crossroads of some exciting new disciplines. 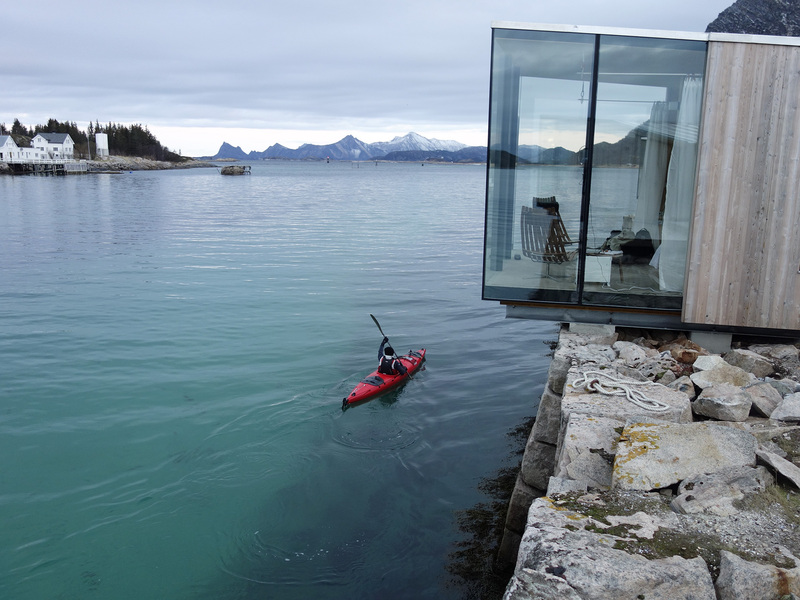 Stokkøya's Food Laboratory ensures it will remain on the cutting edge of New Nordic Cuisine, while the architectural innovations on its rocky coastline has it at the forefront of studies into the interplay between marine and social environments. South of Trondheim, high in the inland district of Valldal, Juvet Landscape Hotel near Geiranger fjord is the pride of its owner, Knut Snilling. A series of "cubes on stilts" they are a glorious amalgam of glass and wood, a triumph of organic simplicity overlooking a dramatic bend in the Valdolla river. No rocks were blasted to make way for them, nor any terrain altered. Chosen as a location for the 2015 British science-fiction film Ex Machina, a night wouldn't go by when its 1914 barn/dining room didn't have someone there because of this acclaimed movie and its showcasing of the stunning, though isolated and therefore often overlooked, Valldal valley. Norwegian farmers call Norway "boulder country", and the drystone walls around Aurland 29/2, a traditional farmhouse near the Aurlandsfjord remain as testament to the strength of a family who, in the 19th century when the great Norwegian migration to the United States was at its height, decided instead to stay in a region that has been continuously settled since the Viking Age. My final night in Norway was spent at Aurland 29/2, and how appropriate that it was. Bespoke, after all, means simply "made to specification", and this 350-year old farmhouse was and is surely that, reborn with stairs constructed from leftover wooden beams, its doors rescued from old timber yards, its interior draped with rugs from Iran, with cow hides on its floors and vintage bed covers from Dublin. Aurland 29/2 makes the vernacular look contemporary. It even has original furniture by none other than the revered Danish designer Hans Wegner, the "Master of the Chair", one of the giants of 20th century furniture design. And wouldn't Håvard, Børge and Knut love to get their modernist hands on some of that. Several of 50 Degrees North independent tours includes stays in these design hotels. Norway by Design and History, a 9 day independent self-drive thorugh the fjords and coast of Norway. 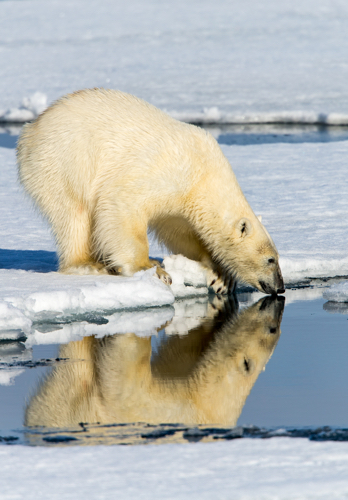 Arctic Sanctuary by the Sea, a short 3 day stay at Fordypningsrommet. 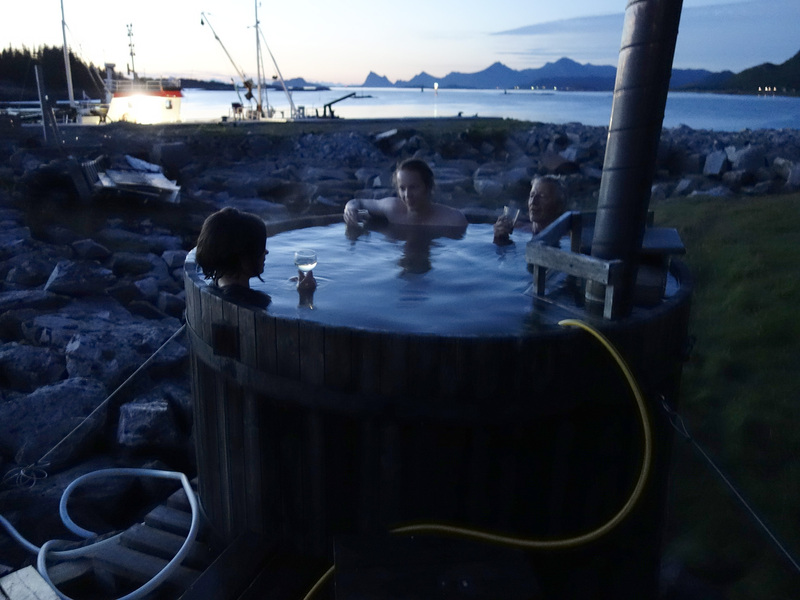 White beaches, Sea & Manshausen Island, an active 4 day Norwegian break staying at Manhausen. Many of our unique fjord tours stay at Aurland 29|2, in the heart of the Norwegian fjords. Thank you Barry for sharing your story with us at 50 Degrees North.